It has been hot, hot, hot in Toronto! I have a love/hate relationship with the heat. Love: summer dresses, sunglasses, my little vegetable garden, drinks on patios, and excuses to go to the beach way too often. Hate: applying sunscreen constantly, getting it in my eye, causing my eye to water profusely and therefor having mascara run down my face making me look like I have a black eye, but of course not discovering this until after I chatted up the cute boy in the coffee shop. We’ve all been there, right? Right?? Anybody??? Sigh. One thing I do love about summer is how my cravings for cold crispy fruit and veggies reach an all time high! All I want is fresh, sweet, smoky flavours… and peanut sauce. Because when don’t I want peanut sauce? 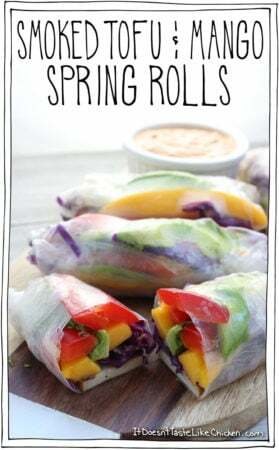 These Smoked Tofu & Mango Spring Rolls hit all my summer cravings, the sweet mango, the creamy avocado, the crisp red pepper and cabbage, the layer of smoked tofu, and of course peanut sauce. Yes! Friends, do you know of the wonders of smoked tofu? It is super common in my grocery store, so I am hoping it’s easy for you to pick up as well. It’s one of my favourite toppings for a quick sandwich (note: I never call sandwiches sammie’s because that’s my name so it sounds weird to me). 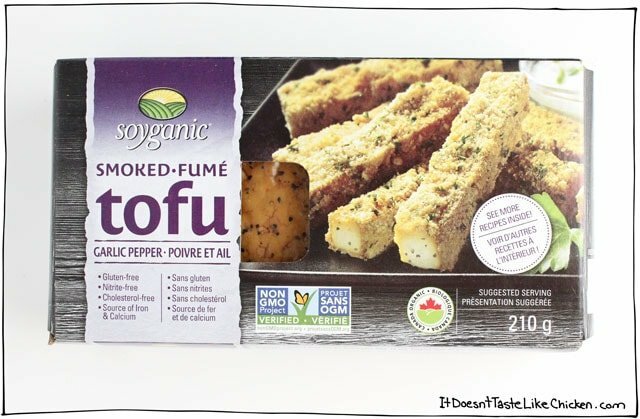 If you are looking for a kind of sliced meat substitute but you don’t want the more processed stuff, smoked tofu is where it’s at. It adds the perfect amount of oomph to these rolls. Check it! So much rainbow deliciousness. 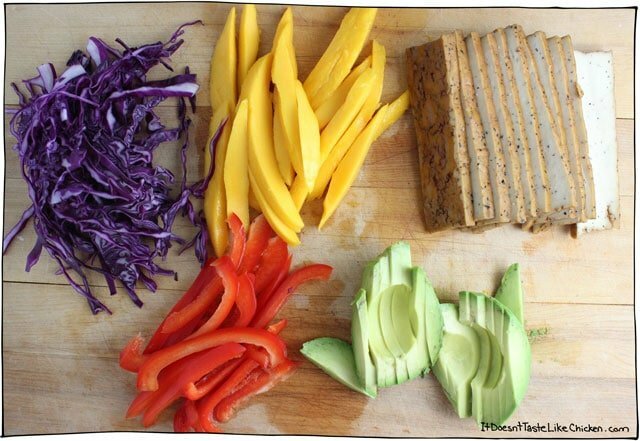 We all know I am a fan of a rainbow of veggies. 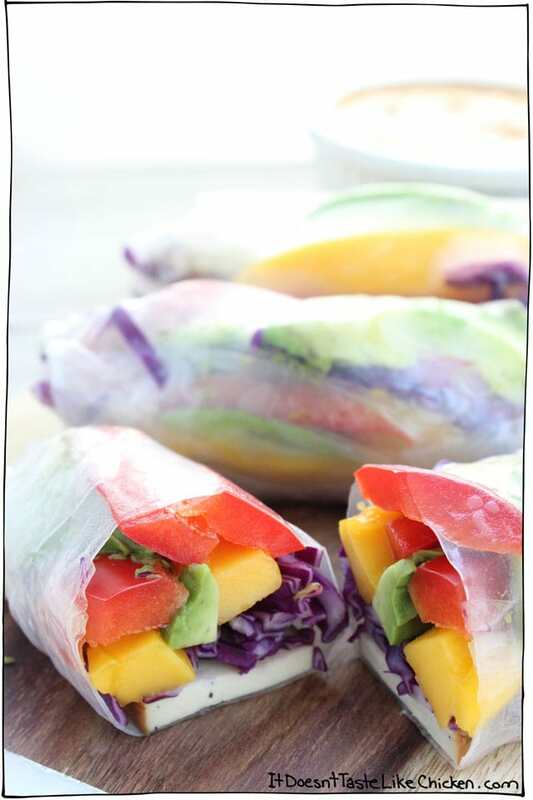 Hello Rainbow Shirataki Bowl, I just can’t help but want the full spectrum of flavour. Taste the rainbow! (And not in the artificial Skittles kind of way… even though Skittles are totally vegan). 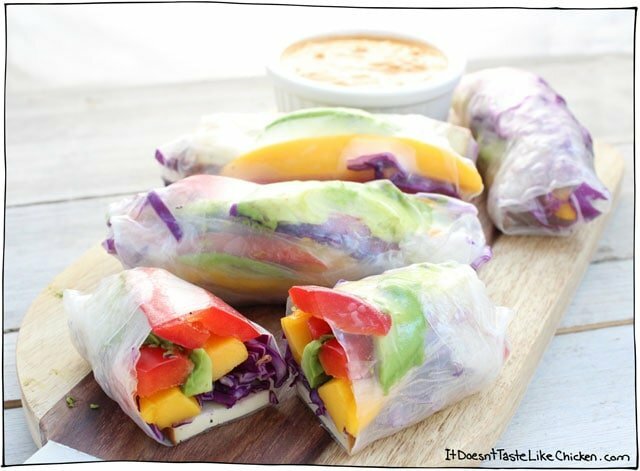 To make these rolls, chop up all your veggies and the tofu into long strips. Run a sheet of rice paper under warm water for a few seconds, you can just run it under the tap or fill a bowl with warm water. Lay it on a clean working surface, it will be firm, but will soften quickly. 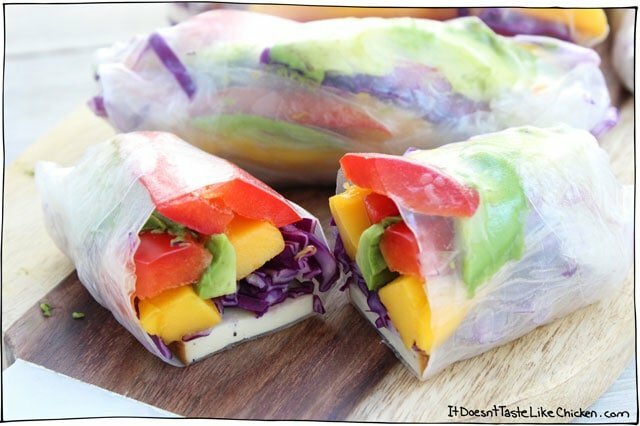 Lay a few slices of each ingredients on top, and when the rice paper is softened you can roll it all up like a burrito. Repeat until all of your fillings are used up. In the meantime make the peanut sauce by combining everything in a bowl. Use that for dipping and feast away! 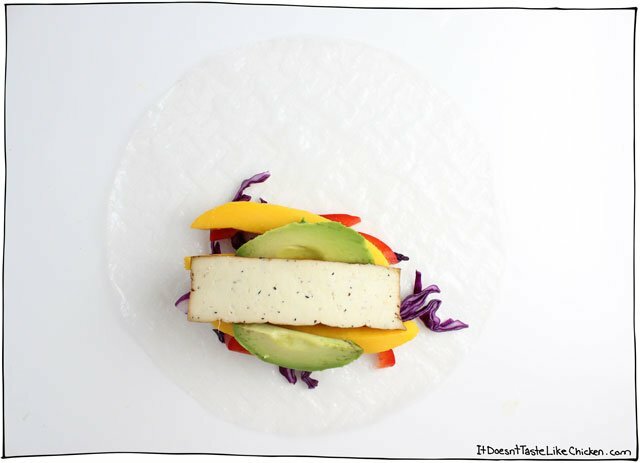 The perfect combo of smoky tofu, sweet mango, creamy avocado and crisp veggies, all topped with a peanut dipping sauce. Perfect vegan, vegetarian, gluten free appetizer. 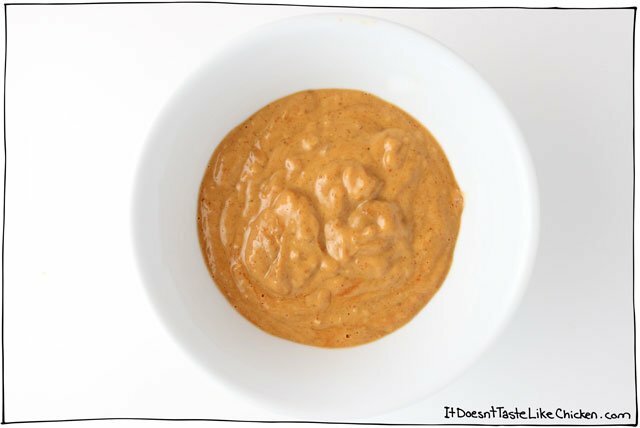 In the meantime make the peanut sauce by combining everything in a bowl. Previous Post: « Sweet Potato Toast!? Hahaha love it! Sandwaanch… I’m going to say that from now on! Too cute. Wonderful recipe! I was surprised at how filling it was, too. My carnivore husband loved them, too. Thank you for posting! Gosh Sam, everything you make looks so beautifully delicious! This recipe really makes me reconsider telling my husband “Nah, I don’t need a food processor, I can just use a knife.” This looks like the perfect food processor meal! This smoked tofu the same as Nasoya baked tofu? I’ve seen packages of that at the grocery store. Also, is rice paper at most grocery stores in the Asian food aisle, or more likely a specialty store? Finally, I so hear you on the sunscreen in the eyes! Haha! Perhaps in Africa the tap water isn’t safe but here in Canada most of the tap water is perfectly safe regardless of the temperature. Not all bacteria is dangerous, quite the contrary. Hi hon. I would Highly suggest that no one runs the wrappings under warm water from the faucet as bacteria gets in the warm and hot water. I would heat some filtered water on the stove, warm it a little and use that. The tap water in Canada is safe to drink, so we are lucky enough to not have to worry about that problem. Good to note if you are from a different country where the tap water might not be so safe! Made the vegan chocolate pudding cake and OMG!! It was heavenly and devoured by all!! I’m so glad I chose to double the recipe so I would have some leftover for the next day. 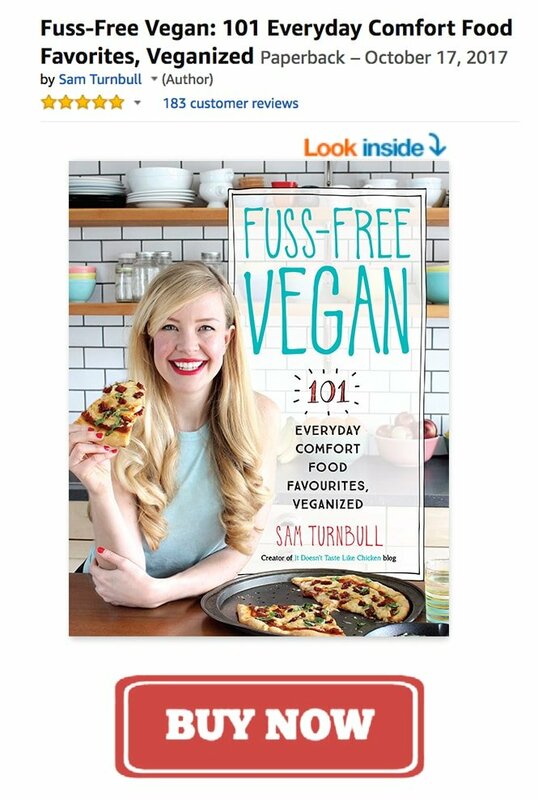 This is definitely a keeper and I’m planning to make many more of your recipes. Loving this blog!! Do you think my local Asain grocery may have smoked tofu? My regular grocery doesn’t carry it. I liven Africa and it’s even harder to get tofu. Have you tried making it from scratch? It’s not that hard and there are videos on Youtube…. Yay! So happy you are loving my recipes and blog so much 🙂 Hmmm I was wondering how available it was for everyone. Yes, I think you might be able to find it in your local asian grocery store, if not, you could drain and press extra firm tofu, and then marinated it in a bit of soy sauce and liquid smoke thinned out with water. I think that would get you a pretty similar flavour. Hope that helps!